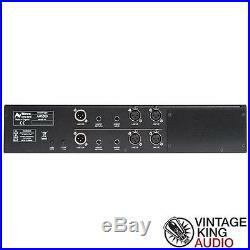 Neve 1073DPX Dual Microphone Preamplifier / EQ. Launched in 1970, the Neve 1073 Classic soon became the first choice mic preamp for leading producers and artists. Found on some of the most famous recordings of the past 40 years, the big, punchy sound of the 1073 complements any musical genre from rock to rap to classical. Designed and built in England, the modern-day Neve 1073DPX is produced to the exact specifications of the original with matched components to ensure the sound remains true. 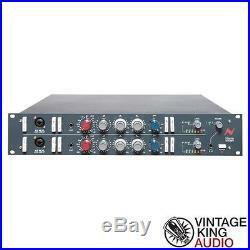 The 1073DPX has two channels of Neve 1073 Class A design microphone preamplifiers, each with 3-band EQ (fixed HF plus two switchable bands with cut/boost capability) and high pass filter. The Neve 1073 DPX mic pre and EQ combination adds warmth and depth to recordings, brings out subtle ambience, maintains spatial positioning, and captures a more precise image embodying, think many engineers and producers, the essence of the genuine Neve sound. Building on the 1073 classic module features, the 1073DPX introduces extra functionality with integrated DI input, phantom power, selectable Insert feature, level meters, selectable headphone monitoring and I/O connectors on each channel for easy and direct connection of microphones and instruments. The 19 rack-mount 2U unit includes an external multi-voltage PSU. 2 independent, genuine Neve 1073 transformer-coupled microphone preamplier / EQ circuits, in a single 2U 19 rack mount enclosure. Exclusive Neve Marinair transformers used on each input and output stage. Convenient connections for Mic, Line & DI inputs on front of unit, with switchable mic/line input connections on the rear of the unit. Switchable +48v Phantom Power, Hi/Lo impedence, -20dB pad and DI ground lift on the input stage. Switchable Phase, and EQ in/out. Insert Send and Return loop feature allows external equipment to be connected easily to the 1073DPX audio chain, such as mono/stereo limiter/compressors. Pre-EQ insert send/return - a line level send is available from the mic - pre amp output stage and a return just before the EQ stage. Post-EQ insert send/return - a line level output send is available from the post EQ stage and a return just before the main output stage. Independent channel output level controls. 7-stage LED signal level meters for each channel - can show mic/line/DI input-stage level, EQ-stage level or output-stage level up to +24dB. Headphone output with adjustable volume control, can listen to channel 1, channel 2 or both channels combined. Should a problem ever arise, our team will go above and beyond to facilitate your gear's repair or replacement. We think that having an unexpected gear problem is headache enough, so we take care of every detail to get you and your gear back up and running as fast as possible. When you choose Vintage King, you're automatically covered. Call 1.888.653.1184, and press 2. If outside the United States please call 1.248.591.9276. Please be aware that pro audio is susceptible to damage during transit. Be sure to retain the original packing materials, original receipt and all merchandise tags for any item that you wish to return to us. If an item arrives damaged, make certain you examine all boxes before acceptance. The delivering agent MUST note damage to any cartons on the release form or refuse acceptance. To learn how to become verified. To reserve your right to return the gear within 30 days, please observe these steps upon receipt of item(s). Use a razor blade or scissors to carefully open any sealed packaging. Take note of how components are packed. Keep all items in new condition unless 100% sure you're keeping the gear. We recommend rack mounting only after you're certain you're keeping the gear. If rack mounting, use plastic washers and beware of metal rack screws' tendency to scratch rack-mount holes. Contact Vintage King to obtain a Return Authorization (RA). Place a copy of the RA inside the package of the items for return. Write RA number anywhere on your airbill, not on the box or packaging. Remember you own it until we receive it. Products like software, computers, computer hardware, hard drives, tape, ribbon mics, personal items (such as headphones, etc), oversize or overweight items, and special order items are not returnable. We will inspect your return once it's received. All costs are the sole responsibility of the customer. Non-Refundable Items While most items are available for return, the following items are excluded. Personal items (earphones, headphones, windscreens, pop-filters etc). Please contact your sales representative at 1.888.653.1184 or 1.248.591.9276 and press 3 for further information. Those items will be posted as such. The documentation and/or related graphics published by Vintage King could include technical inaccuracies, obsolete issues or typographical errors. Vintage King assumes no responsibility for errors or omissions in the information or other documents which are referenced by or linked to its website. CHOICE OF LAW This Agreement has been executed and delivered in the State of Michigan and shall be governed by and construed and enforced in accordance with the laws of the State of Michigan. The item "Neve 1073DPX Dual Microphone Preamplifier / EQ" is in sale since Tuesday, April 26, 2016. This item is in the category "Musical Instruments & Gear\Pro Audio Equipment\Preamps & Channel Strips". The seller is "vintagekingaudio" and is located in Ferndale, Michigan.